Since 2011, Sport Creative has been proud to provide pro bono design support to DC Strokes Rowing Club, an all-volunteer run organization committed to building an inclusive environment, fostering personal growth, and promoting a spirit of sportsmanship. 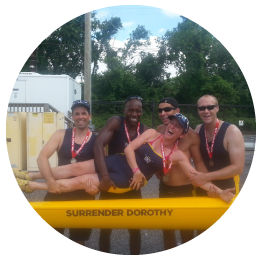 DC Strokes is one of only a handful of dedicated, independent LGBT rowing clubs in the world. We first got involved with DC Strokes in 2001, when it was celebrating it’s twentieth anniversary. That year we helped out by providing a “brand refresh” that started with a new logo, and carried across multiple platforms, including print marketing materials, web, and team uniforms. We’ve followed up with services throughout the years for marketing happy hours and special events, learn to row programs, boat decals for the growing fleet, and, once a year, artwork for Stonewall Regatta, which Strokes hosts. This design will be available on t-shirts on regatta day, printed on-site and on-demand by Northwest Design Ink. Want one? Drop me a line at rachel@sportcreative.biz.